My little Garden early this morning. Still looking good Mossy at this time of year. Whats the plant with the berry's on Mossy? That's a fab garden. Delightful as always, just love your garden. Thank you all for you nice comments, The plant with the berries is a Pyracantha Orange Glow, which I have made a cloud. Thank you Mossy ! Wow, your garden is beautiful ! Oh My Gosh! Stunning! Brilliant idea to topiary the pyracantha! 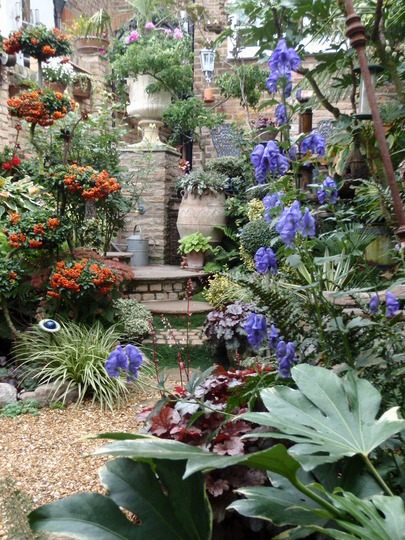 One of the finest small gardens that I have ever seen. It is very close to the gothic style garden but with a small hint of baroque in it. It's hues and tints remind me of those used by the painter Claude Lorraine. Upon entering this garden in the morning, one takes company with the greek spirit Phantasos. Coming into this place under the light of a full moon....would transform one into a cloud of vapor. You have one of the best gardens ever Mossy. This one has gone straight into faves. Once again, thank you everyone for your wonderful comments, it brightened my day up. It is so nice to read Eclectic descibing my garden as being gothic with a hint of baroque as it is exactly what I try to achieve. Of course there is still a lot of structural work that I need to do but anyway ....one day! What a beautiful little garden ! I love the Pyracantha ! Have never seen one clipped like this before ! Clever ! That's an amazing idea, whatch out my pyracantha!! Glad you inspired 'Eclectics' imagination and love of writing and books!! You are the first Frenchman I meet on this area..
You have created a wonderful area here. That would make a lovely painting , and I wish I could keep the picture there so that I could paint it.I could just see it in a frame on my wall!I can see that you are very artistic. i wish could have a garden like that! !very beautiful!! Hi, as a newcomer to this site I am having such fun going through the photos, (their're quite inspiring..)I love your little garden, what an oasis of beautiful flowers and structures. I'm moving soon from a 70' garden to a small one, so will have a blank canvas to discover.....! Thank you very much for your nice comments Little Arti, there is so much you can do in a small garden, I am sure it will look very nice as it is good to have a blank canvas.